Observations of how the youngest-known neutron star has cooled over the past decade are giving astronomers new insights into the interior of these super-dense dead stars. Dr Wynn Ho presented the findings on Thursday April 15th at the RAS National Astronomy Meeting in Glasgow. 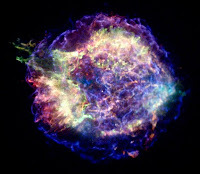 Dr Ho, of the University of Southampton, and Dr Craig Heinke, of the University of Alberta in Canada, measured the temperature of the neutron star in the Cassiopeia A supernova remnant using data obtained by NASA’s Chandra X-ray Observatory between 2000 and 2009. “This is the first time that astronomers have been able to watch a young neutron star cool steadily over time. Chandra has given us a snapshot of the temperature roughly every two years for the past decade and we have seen the temperature drop during that time by about 3%,” said Dr Ho. Neutron stars are composed mostly of neutrons crushed together by gravity, compressed to over a million million times the density of lead. They are the dense cores of massive stars that have run out of nuclear fuel and collapsed in supernova explosions. 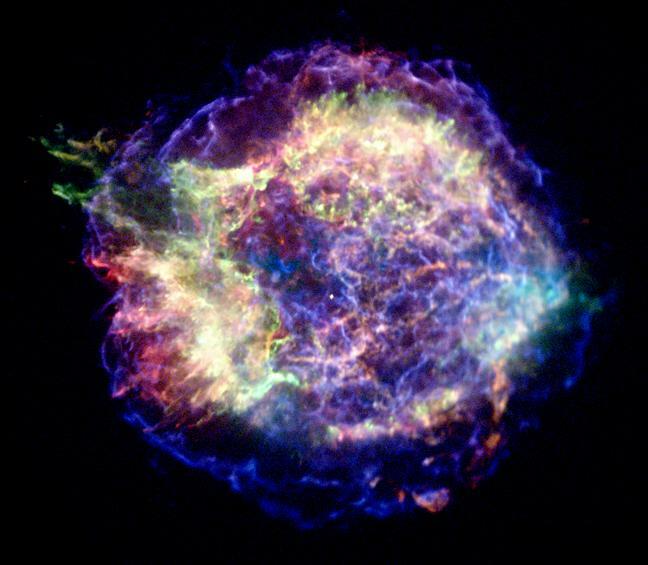 The Cassiopeia A supernova explosion, likely to have taken place around 1680, would have heated the neutron star to temperatures of billions of degrees, from which it has cooled down to a temperature of about two million degrees Celsius. “Young neutron stars cool through the emission of high-energy neutrinos – particles similar to photons but which do not interact much with normal matter and therefore are very difficult to detect. Since most of the neutrinos are produced deep inside the star, we can use the observed temperature changes to probe what’s going on in the neutron star’s core. The structure of neutron stars determines how they cool, so this discovery will allow us to understand better what neutron stars are made of. Our observations of temperature variations already rule out some models for this cooling and has given us insights into the properties of matter that cannot be studied in laboratories on Earth,” said Dr Ho. Dr Ho and Dr Heinke observed an overall steady trend over the 10 year period, there was a larger change around 2006 that suggests other processes may be active. “The neutron star may not yet have relaxed into the steady cooling phase, or we could be seeing other processes going on. We don’t know whether the interior of a neutron star contains more exotic particles, such as quarks, or other states of matter, such as superfluids and superconductors. We hope that with more observations, we will be able to explain what is happening in the interior in much more detail,” said Dr Ho. Dr Ho and Dr Heinke have submitted a paper on their discovery to the Astrophysical Journal.